Treat Your Amps and Speakers the Way They Were Meant to be Treated with an Extra 24dB of AudioControl Pure Magic! Seattle, WA. January 8th, 2012 – AudioControl, the U.S. leading designer and manufacturer of award winning products that transform the sound performance of in-car audio systems, today announced the launch of the Matrix Plus, a new six channel high-performance line driver that transforms the in-car audio and multimedia experience. 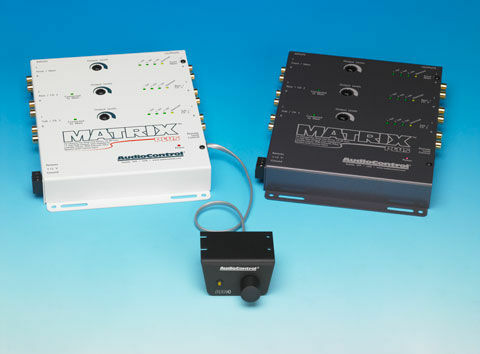 The extensive features of the Matrix Plus include 24dB of signal gain (13 volts peak output), PFM subsonic filter, output level controls, balanced differential inputs, linkable inputs (2 input channels to 6 output channels), very low impedance outputs, voltage indicator LED’s and the ability to add on an optional ACR-1 remote level control. The Matrix Plus is designed to meet a market need for a high-performance, competitively priced line driver that allows the flexibility of delivering audio signals from two inputs and powering these downstream to multiple amps creating amazing sound quality and level at a great price. The Matrix Plus’s outstanding increase in signal level, guaranteeing up to an extra 24dB in pre-amp signal, meets the need for any upgrade in car audio sound quality, providing a leading solution in improving the in-car driving experience today for all motorists. Jay Small, AudioControl’s AutoSound Sales Manager stated that “The Matrix Plus allows seamless integration of in-car multi-media as well as the ability to drive dozens of amplifiers, the Matrix Plus gives car entertainment systems the boost they need today to maximize the audio and multimedia sources and deliver this performance to the amps and speakers effortlessly”. With multiple sources, like audio or multimedia, the Matrix Plus level matches the different volume levels, so switching between them is seamless. For car audio enthusiasts, the internal linking system of the Matrix Plus means that two channels of input can drive all six outputs and each output can drive up to seven amplifiers delivering outstanding audio performance. Small added “that the introduction of the new Matrix Plus brings to the market a unique, dealer led product, at an affordable price that transforms the audio and multimedia performance of the in-car entertainment experience”. Small emphasized that “having the Matrix Plus as part of a dealers mix offers a one-stop solution for increasing audio and multimedia performance and allows our dealers a great way to drive sales, customer satisfaction and truly release the performance of the amps and speakers that they sell everyday”. Full details of the Matrix Plus can be found at AudioControl’s website, www.audiocontrol.com or on Facebook. The Matrix Plus will begin shipping to all U.S. and international dealers and distributors in January, 2012. The Matrix Plus will be on display for the first time at AudioControl’s booth at CES in Las Vegas from January 10th-13th, 2012. AudioControl is a U.S. designer and manufacturer of the highest quality car audio, theater processors, distributed audio amplifiers, signal processors and precise analysis products, celebrating more than 30 years of ‘making good sound better’. The company’s headquarters, including research and development, manufacturing, production, and training facilities continue to thrive in Seattle, Washington heart of the rainforest of the Pacific Northwest.